It's lovely to sit back and look at progress on the current 'active' works in progress. I love casting on and the rapidly-approaching Father's Day gives me a great excuse to cast on and also gives me a very real deadline, so there'll be some late nights over the next few days. The balls of Rowan All Seasons Chunky were part of a parcel gratefully received from Knit Now magazine; they liked the letter that I wrote about my finished Twinkle. (Star letter KN number 22). More of that later. 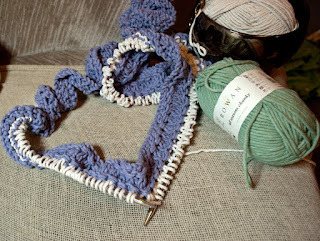 The very chunky scarf on 7mm needles is the perfect antidote for my current 'lace' phase. 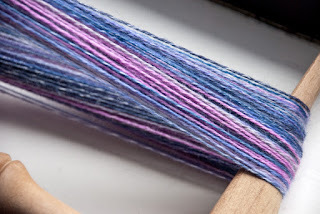 Here are the socks I'm making from a wool / silk / yak mix from Picperfic's Fluff & Stuff luxury fibre club. They're going to take ages - the lace and cable pattern (yes real cables in socks) on 2.25mm needles. You can see that I'm now past the heel on the first sock. And in spinning news, again with the fine yarn, this is the first skein of luxury fibre from Yummy Yarns, to be a cowl for me. The prize that I mentioned earlier also included this amazing book. 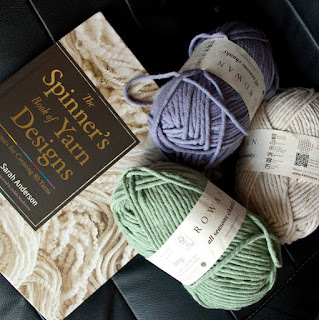 It really does feature 80 different yarns / techniques. Lots of inspiration there and I'll be reviewing the book here shortly. Love the colour of your socks, such patience! I have the book too - its a great resource! 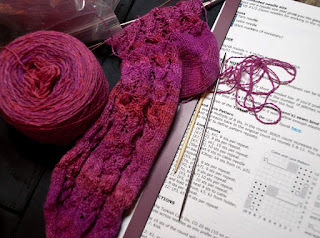 I envy your patience - cabled socks on 2.25mm and in pink, gorgeous! !